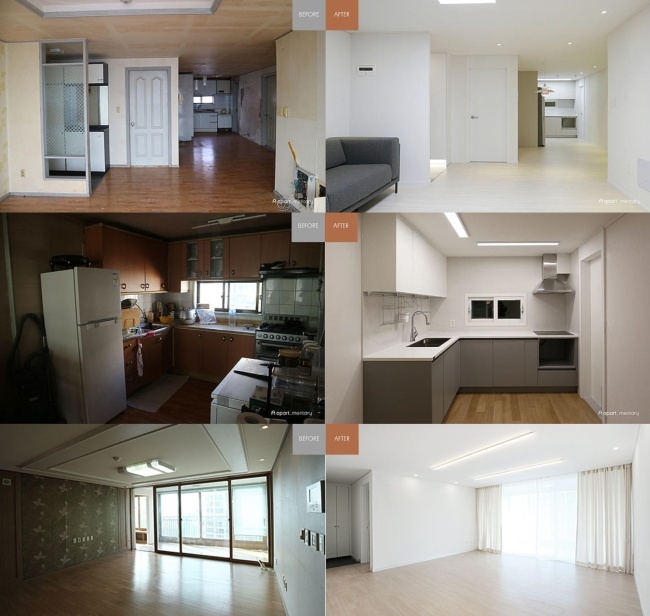 In the city of Seoul, many of us live in apartments. The common housing form, however, is not usually considered a cozy space tailored for the residents’ needs. Rather, it is usually thought of as the outcome of mass production, a realistic way to house more people in less space. Should then we accept the reality and live in dreary, boring spaces? No, according to Yoon So-yeon, founder and CEO of interior design startup Apart:mentary. We all have the right to live in a nice home. And more, she stresses this should not be a challenge. Yoon is a producer-turned-interior designer who once worked at broadcaster MBC. Contrary to how apartments are typically viewed, Yoon had dreams about the space. Living in shabby studios by herself for 10 years, she had wished to live in an apartment without having to worry about rental contracts. When she got married five years ago, she jumped at the chance to decorate the couple’s apartment to meet their needs. 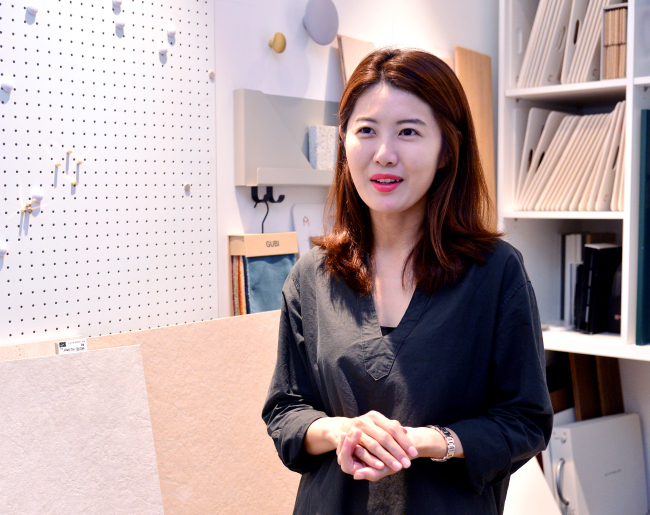 She budgeted 30 million won ($26,600) toward the project, a huge sum for her, but not for the interior designers who said it would not be possible to do what she wanted at such an amount. “So, I decided to do everything myself,” she said. Yoon shared the process with the public via online posts, which soon went viral. In 2015, she compiled the posts to publish “Interior One Book” and became a best-selling writer. In response, she launched interior design startup Apart:mentary that year. The startup is particularly known for its Five service, marketed under the concept of a “smart interior solution.” The service changes five elements crucial to an apartment interior: cabinet doors, wallpaper, lighting, floors and curtains. The emphasis is on quick and easy aspects. By entering numbers related to one’s home, such as the floor space or how old it is, on the website, an estimate can be provided based on figures of the business’s previous 100 projects. Using this one-stop service, clients can choose everything at the office, and the whole process from consulting and selection to construction takes around two weeks, with a cost of approximately 10 million won for a 99-square meter living space. “It is definitely cheaper to do it by yourself. But there are people who do not have the time to do the footwork,” Yoon said. “When they get off from work, interior shops are closed and people are exhausted. A typical Apart:mentary client is a professional in his or her 30s or 40s -- too busy to do the job themselves. The clients are largely satisfied that they have to talk with only one person in working with Apart:mentary. There is a project manager assigned to each who takes care of everything. Looking at the portfolio the results, however, appear somewhat similar overall. 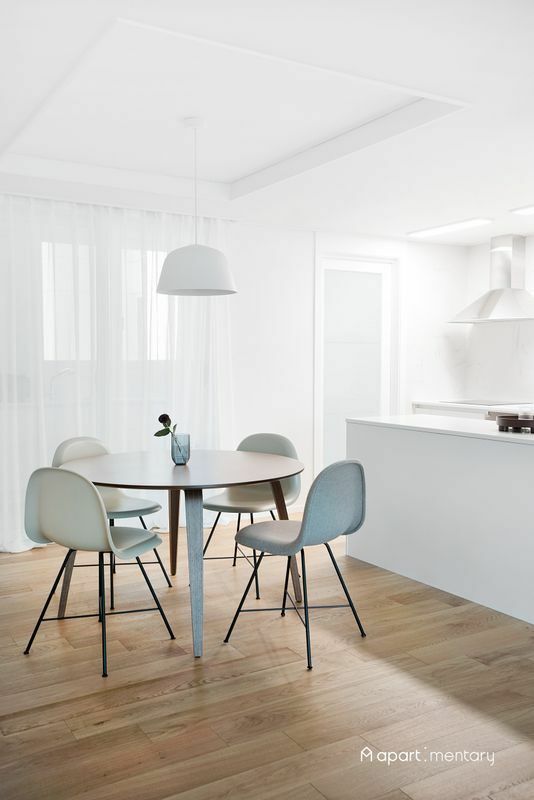 The apartments are all white-toned, bright and decorated with a minimalistic approach in the Scandinavian design style that has been trendy here for the past few years. According to Yoon, construction companies from Hong Kong and Singapore are showing interest in Apart:mentary, as there is a lack of interior design firms for apartments there. Also, the firm hopes to grow as a lifestyle commerce business, curating products related to living, and to enhance the overall interior.